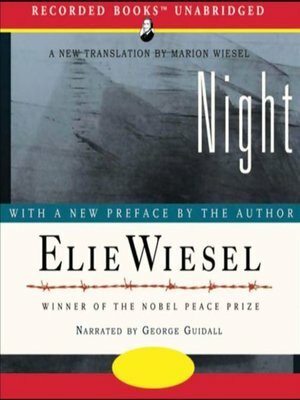 An enduring classic of Holocaust literature, Night offers a personal and unforgettable account of the appalling horrors of Hitler's reign of terror. Through the eyes of 14-year-old Eliezer, we behold the tragic fate of the Jews from the little town of Sighet. Even as they are stuffed into cattle cars bound for Auschwitz, the townspeople refuse to believe rumors of anti-Semitic atrocities. Not until they are marched toward the blazing crematory at the camp's "reception center" does the terrible truth sink in. Narrator George Guidall intensifies the emotional impact as blind hope turns to utter horror. His performance captures the profound agony of young Eliezer as he witnesses the suffering and death of his family and loses all that he holds sacred.